The Pop-Tart was originally created as a way to capitalize on fancy new dog food foil freshness technology. True story. In the early 1960s, Post created a method of wrapping dog food in foil, preserving its freshness without the need for refrigeration and effectively ending hilarious primitive sitcom dog food eating gags. Looking to expand its successful line of cold breakfast cereals, the company developed a foil-wrapped breakfast pastry called Country Squares. An overly-enthusiastic early 1963 unveiling of this product gave competitor Kellogg plenty of time to develop its own version. Pop-Tarts became an overnight sensation. If you close your eyes and tear open a packet you can still smell the dog food. 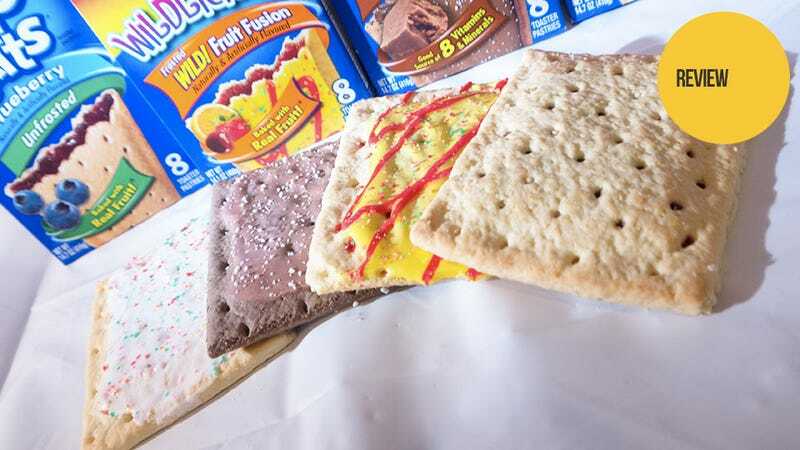 One of the most prevalent and parent-accepted examples of the stuffing things in other things family of snack foods, Pop-Tarts are devoured by millions of children around the globe every morning. While they can be eaten at any time of day without endangering the eater or the eater's loved ones, Pop-Tarts are a very breakfast-centric snack—most grocery stores in the U.S. stock Pop-Tarts in the cereal aisle. There are as many varieties of Pop-Tart as there are stars in the sky, only way fewer. The Wal-Mart I sent my snack procurement team to featured at least 15 varieties, from the tried and true (cherry, blueberry) to the more obscure (s'mores, pumpkin pie). For the purposes of this review I chose four flavors that I felt represented the wide spectrum of the Pop-Tart kingdom. "But Fahey, wouldn't a true snackologist sample every available flavor before reaching a verdict?" Good question! Shut up. Realizing that the plain, unfrosted Pop-Tart was about as exciting as the taste of the heartburn-inducing shortening and flour crust, Kellogg takes every opportunity to layer on sprinkled, color-swirled and crumb-caked "frosting" in order to attract the eyes of hyperactive children, the shortest path to a parent's wallet. I associate the difference between frosted and unfrosted with the different plumage displayed by birds in the wild. The frosted varieties are the males of the species. Their colorful decorations help them stand out in a competitive market, attracting mouth-mates with their splendid display. The unfrosted or female varieties are there for when someone just wants a f***ing Pop-Tart. Pop-Tarts were created with toasting in mind, but there is a great debate amongst fans of the pastry tiles about whether or not such heat treatment is necessary. On one hand, heating up a Pop-Tart makes the crust somewhat crusty, opposed to the incredibly stale bread texture of an unheated unit. On the other hand, applying heat to Pop-Tart filling creates temperatures equivalent to those of a tiny star. They have been known—and I am not making this up—to set toasters on fire. Just look at the video. If you're a big fan of toaster-based slow-cooking, these babies can seriously screw with your day. Essentially, in order to heat up a Pop-Tart you have to wait for it too cool before eating it anyway, so why waste the time? Let's take these 'tarts, one-by-one. In case you missed the subtle subtext I've woven throughout the article, Pop-Tart crust is horrible. If Kellogg marketed a line of empty Pop-Tarts, they would languish on store shelves for months, eventually rounded up and shipped to third-world countries to construct cheap housing. Blueberry is the only unfrosted variety worth a damn in my book, and only because the filling is so sickly-sweet that the thought of frosting on top of it makes my face go all screwy. My second-favorite Pop-Tart variety (brown sugar cinnamon is too perfect to review; also the store was out of them), Strawberry Frosted avoids the over-sweetness of Blueberry Frosted by employing the power of illusion. Those colorful sprinkles make everything taste better. It's magic. Here Kellogg adds cocoa powder to that horrible crust material, making it slightly less horrible in the process. The chocolate filling is satisfyingly dark and rich, while the outer shell almost makes one forget they are eating a product born of dog food preservation. If they had called these "Fruit Punch Pop-Tarts" I would have vomited just reading the box, saving me the trouble of eating these. It doesn't help that they look like a shirt Dave Coulier wore during an episode of 80's sitcom Full House. No food should remind you of Dave Coulier. So what of Pop-Tarts as a whole? It's hard to ignore the attraction of a "breakfast" food that comes in its own dog food preserving container. They're quick. They're easy. They are self-contained. The question here is are "quick" and "easy" really the attributes we should be celebrating in a snack aimed at the most important meal of the day? Sure, why not? Who has time for breakfast anymore? It's a busy world, you blink and you're dead. These might be horrible, but there is no blinking involved. There's Kellogg's new slogan right there. Pop-Tarts—F*** Breakfast.